Auctionpay Event Software Version 4.2 is a versatile application that provides nonprofit organizations the ability to track and manage fundraising event details in a central location. This system has multiple modules and has the capabilities of handling all aspects of an event including the ability to add and edit event information, manage reservations and creating an event catalog which can be printed or used online. Auctionpay Event Software is integrated with Auctionpay Online Payments used for registration, and Auctionpay Event Payment terminals for payment processing, which enables your nonprofit organization to handle all aspects of an event on one easy to use application. 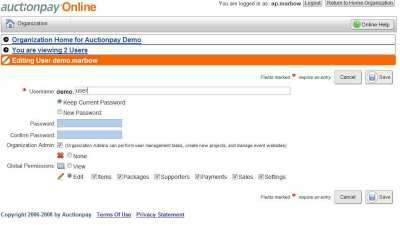 The Auctionpay Event Software is very easy to use. 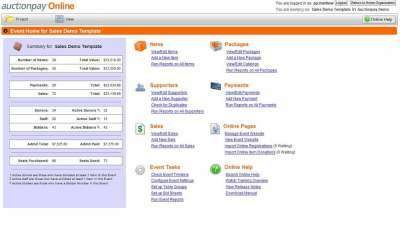 The layout of the homepage is thoughtfully designed and everything is displayed and can be accessed by pointing and clicking. Another nice feature is each event has a homepage, and on left side is an overview of the entire event, including dollar amount and number of participants. To the right is the menu which is colorful and has a title and subtitles for each module of the different stages of planning an event. This system covers all aspects of planning an event from tracking and managing all event and guest details in one centralized location. You have the ability to track everything from the bidder to the items procured for the event, prior and during the event. The event planners are able to assign tables and create seating arraignments, and also organize donated items into packages. When the guests are ready to leave you can quickly check them out and produce professional and itemized receipts right there while they are waiting. This system covers the whole spectrum of a nonprofit organization’s fundraising events. The Auctionpay Event Software runs on Windows 2000, XP, and Vista. It requires 32MB RAM and 60MB disk space. The online browsers can be Internet Explorer 6 or higher on Windows and 3.0 on Safari, and with Firefox 1.5 or higher. Updates come out about three times a year and can easily be downloaded. The Auctionpay Event Software is very well designed and user friendly. It is colorfully designed and the lay out is well thought out. Every module and application is just a click away. This software is specifically designed for nonprofit organizations fundraising events and can be networked for an unlimited amount of workstations. Auctionpay’s client services team provides complete event support and services including phone, email and online support. There is a variety of materials that can be quickly created to make the event look polished and professional such as; letters, catalogs, bid sheets and reports. Auctionpay provides an integrated solution to manage live auctions, special events or online fundraising activities. This is a versatile, all in one application that will organize every detail of a fundraising event from start to finish. This software has security with administrative rights to regulated access for multiple users and online access to the event details. Prices vary depending on the size and type of services.